My mother has always wanted me to become a teacher. I consider teaching a noble profession with far reaching consequences on lives of young people. For this reason, it is an attractive proposition, and I may want to take it up at some point in life. But my mother thinks teaching is ideal because it is a ‘woman-friendly’ profession, where one gets to wrap up work in half a day and be back at home to look after the home and family. Which other line of work gives you a two-month break over the summer and two-weeks in the winter? My choice of career, no matter how independent it may have seemed at the time, was based on expectations of my family and how I could manage them. ‘I want to make documentary films’, I told them. Documentary filmmaking to them meant I would stay in Delhi. Documentary filmmaking to them meant I would not go to Bombay, the big bad world where women are exploited by powerful men. ‘She wants to make films’, my parents told their friends, ‘documentary films’. They were both proud and relieved, in equal amount. My first job in India happened many years later, when I finally received a masters’ degree and returned to Delhi. I worked as an Assistant Director (AD) with a small film production company owned and run by a woman. I was hired on merit and given a lot of responsibilities. I was doing everything from preparing grant applications, to research for films, planning productions, and supervising post-production. One thing that I was not doing was going on outstation shoots. I was somehow always left behind on some pretext or the other. I loved traveling, so my disappointment was evident. Unfortunately, I continued to see this trend of leaving behind female ADs over the next few years of working as a freelancer. A producer once confessed that this was a logistical issue. A female crew member could not share a room with a male crew member, and if there was only one female member in the team, they would rather leave her behind than pay for an extra room. Apart from budgetary issues, there were other reasons why people around me were not hiring women. The assumptions were that women, even though highly qualified and responsible, capable of handling tough situations, sharp and creative, would have nightly ‘deadlines’ from parents, safety issues, would have to seek permission to travel, and very simply, might quit when they get married. I did go on to work on many documentary films over the years, traveling to Chhattisgarh, Uttarakhand, Punjab, Maharashtra – even led a crew of 5 men on a 3-week schedule in rural Orissa. Now, I own and run a film company in Delhi, and I am faced with similar questions – will I pay extra for a hotel room if it concerns a valuable member of my team? Will I take responsibility for an employee who leaves from my office after the metro stops running? Will I accept a request to leave early for safety reasons? Will I invest my time in an employee irrespective of what their marital status is or could be one day? The answer has to be yes, irrespective of gender. The deep rooted gender disparity in film is disconcerting, not only in terms of female representation on film sets, but also on screen. On a recent visit to Bombay (yes, I am venturing into the big bad fiction film world), I met with a seasoned actor who has recently reemerged as an up and coming film producer. She is working hard to bring women’s voices and their stories to the mainstream. She said, ‘if things continue as they are, we will look back at this time in Indian cinematic history and think that all women wore short skirts and lived frivolous lives.’ It is our responsibility to make this right, one story at a time, and leave behind an authentic footprint. Surbhi Dewan is a maker of films and other beautiful things. Foodie. Traveller. Storyteller. 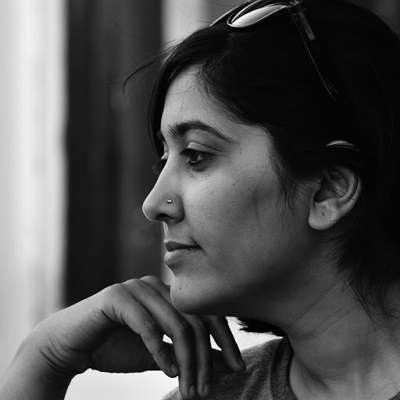 Co-founder & Creative Producer at Painted Tree Pictures, New Delhi.